Supported by Xilinx Zynq UltraScale+ ZU6EG, 9EG, or 15EG FPGA, multiple expansion ports and its unique architecture, the HTG-Z999 can be used as daughter card adding processing capability and/or FPGA gate density to Vita57.1 or 57.4 compliant FPGA carrier boards or as standalone host module. 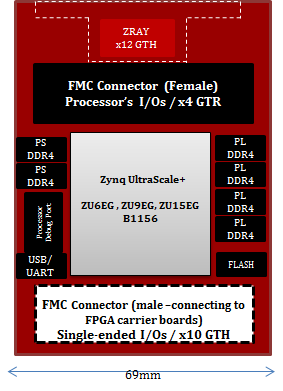 Modular architecture of the HTG-Z999 ZYNQ UltraScale+ platform provides great level of versatility through two (one male and one female) industry standard Vita57.1 FPGA Mezzanine Connectors (FMC) and one HTG High-Speed Bus using Samtec Z-Ray interposer. The male FMC connector (installed on the back side) mates with Vita57.1 or 57.4 FPGA carrier boards through singled ended and/or GTH serial I/Os to provide processing power and additional FPGA density to designs. The female FMC connector (installed on the front side) provides access to the ARM processor's singled ended and GTR serial I/Os. The HTG High-speed ZRAY Bus provides access to 12 GTH Serial Transceivers of the FPGA (PL), single-ended I/O pins (for control functions) and adjustable power supplies for interfacing with daughter cards such as Hybrid Memory Cube (HMC), QSFP+, SFP+, FireFly, and CXP.